11. When Will it End? MARSHALL LAW - very heavy and proud of it. 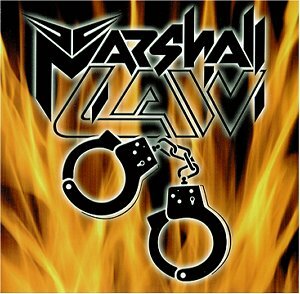 Birmingham's MARSHALL LAW offer twin guitar Power Metal powered by the exceptional talents of vocalist Andy Pyke, twin guitarists Dave Martin and Dave Rothan, bassist Tom Dwyer and drummer Pete Hunt. 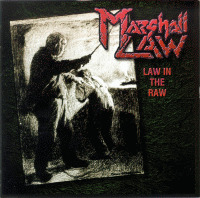 MARSHALL LAW benefited in their early days from the enthusiastic management of Birmingham DJ Dave Juste and the seemingly tireless ability to undertake enormous club tours, including supports to GYPSY QUEEN and HELLION, building up a loyal fan base along the way. Formed in 1988 by ex-DETROIT, DAMIEN and VIVA vocalist Andy Pyke, the original line-up featured Pyke on vocals and drums together with ex-CHINAWHITE and SHADOWLANDS guitarist Dave Martin, bassist Nigel and guitarist Darren Horton. Pre-MARSHALL LAW Martin had also been involved with ELECTRIC WARRIOR, an act that featured latter day ASYLUM vocalist Stan and his sister drummer Yola, as well as STARFIGHTERS and briefly UFO guitarist Rik Sandford. MARSHALL LAW added drummer Alan Kelly, who ultimately left to join SHY. 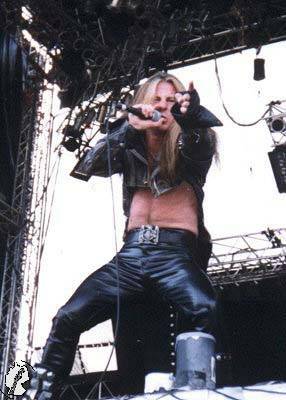 Horton also left to later form SIAM and was replaced by former REALM and IVORY guitarist Andy Southwell. Bassist Nigel also departed, later to join Progressive Rock outfit ARK, and was superseded by Malcolm Gould. This line-up recorded the demo 'Future Shock' in 1988. Despite their efforts the media and major record companies remained unmoved, with the British Rock press refusing to see the band as anything more than pretenders to the throne of JUDAS PRIEST. 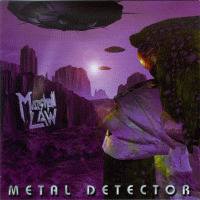 Undeterred, MARSHALL LAW recorded their first album for local label FM Revolver, but in doing so, lost most of their finest songs to what many regarded as a lacklustre production by REDBEARDS members Ian Allen and Dave Keates. It was decided at this point to sack their bassist- the official excuse being that he was too short! The allegedly diminutive Malcolm Gould promptly formed LOVE AND WAR. The somewhat taller benefactor of the vacant bass position was Roger Davis, previously with ROULETTE, and the band still continued to gig hard. Another record for FM Revolver followed, the mini album 'Power Crazy', which debuted new drummer Lee Morris. Pyke meantime was to contribute guest vocals to CEREBRAL FIX's version of JUDAS PRIEST's hit 'Living After Midnight'. A change of management to the same organisation that handled MAGNUM saw a period of inactivity whilst a major deal was searched for, but in vain. 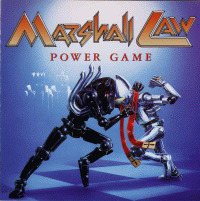 MARSHALL LAW recorded a third album, 'Powergame', with production by ROBIN GEORGE, but this only saw sporadic releases in Japan, where it reached number 6 in the national Rock chart proving a huge seller, and Spain. A thousand copies were also pressed up on the band's own System X Records for sale at gigs. A live album was recorded, but was to remain unreleased for some time, and the group would choose to disband, playing their last gig at Nottingham Rock City in September 1992 and subsequently folded around December. Martin reunited with original drummer Mick Donovan in a new project, Southwell formed an acoustic act with his girlfriend whilst Davies found employment with erstwhile LITTLE ANGELS vocalist TOBY JEPSON. Meantime Lee Morris joined high profile Gothic Rock act PARADISE LOST in 1995. 'Metal Detector' once more pulled in worthy reviews with increased sales in Germany and Japan. 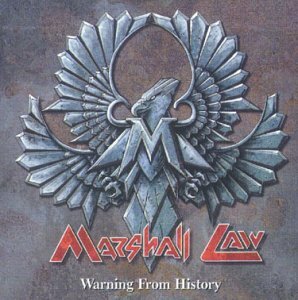 The band recorded the follow up 'Warning From History' in early 1999. The album included guest contributors Steve Grimmett of GRIM REAPER and LIONSHEART and MAGNUM's Tony Clarkin. Once again Neat Records put a major error into the press release for this album, claiming NOISEGATE's Chris Green had performed studio drums. In fact, all of the drums were programmed by bassist Roger Davis. This outing saw the band's first release in South America with Rock Brigade Records in Brazil, Chile and Argentina. Shortly after recording the band dispensed with their existing rhythm section pulling in ex-RECKLESS DAUGHTER, SHOCK TACTICS and SIAM bassist Andy Faulkner and former BENEDICTION and WHITE TRASH drummer Paul Brookes. To promote the album MARSHALL LAW put in a show at the 'Bang Your Head' Festival in southern Germany sharing a bill with DEEP PURPLE, W.A.S.P. and MOTÖRHEAD as well as a performance at the Wacken Festival playing to over 30,000 people. During 2000 the band recorded a version of SLADE's 'We'll Bring The House Down' with a guesting Bev Bevan of BLACK SABBATH on drums. 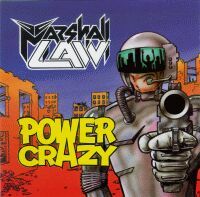 Although the track was produced by the esteemed Terry Thomas, of BAD COMPANY repute, it would remain consigned to the vaults until it emerged as a bonus track on the 2002 Sanctuary Records compilation 'Power Crazy - The Best Of Marshall Law'. Ex-MARSHALL LAW members Roy Davis and Andy Faulkner would gain production credits on the 2000 RICOCHET album 'The Singles'. Davis would also be found to be active with TOBY JEPSON once again, appearing on the 2002 'Refresh' EP. He would also feature in the blockbuster Russell Crowe movie 'Gladiator' as a barbarian extra. In downtime Andy Pyke hooked up with former MARSHALL LAW and present day PARADISE LOST drummer Lee Morris, EXCALIBUR and HARDWARE guitarist Paul Solynskyj and ex-SLAMMER guitarist Milo Zavenic to tour Holland in a METALLICA tribute band DAMAGE INC. Some of Pyke's earlier recordings also surfaced with the release of a vintage live DAMIEN album. Reports surfaced that the Pyke / Southwell / Martin axis was gearing up for a new MARSHALL LAW album. It would be learned in June of 2003 that these sessions were to include former MARSHALL LAW, and present PARADISE LOST, drummer Lee Morris. Early 2004 confirmed the recording of a brand new album 'Axis Of Power' as a remastered version of 'Powergame', remixed by ROBIN GEORGE, was also readied for release. That same year ex-bassist Andy Faulkner gained production credits on the SHY 'Sunset & Vine' album. In early 2005 Faulkner also scored the role of producer for BOLT THROWER. The early part of 2005 also saw the induction of bassist Tom Dwyer, a scene veteran holding credentials with BARDICHE, HEAT, SCREAMING DEMON and IRON SKULL. Ex-MARSHALL LAW drummer Lee Morris joined the ranks of AOR outfit TEN in September 2005. 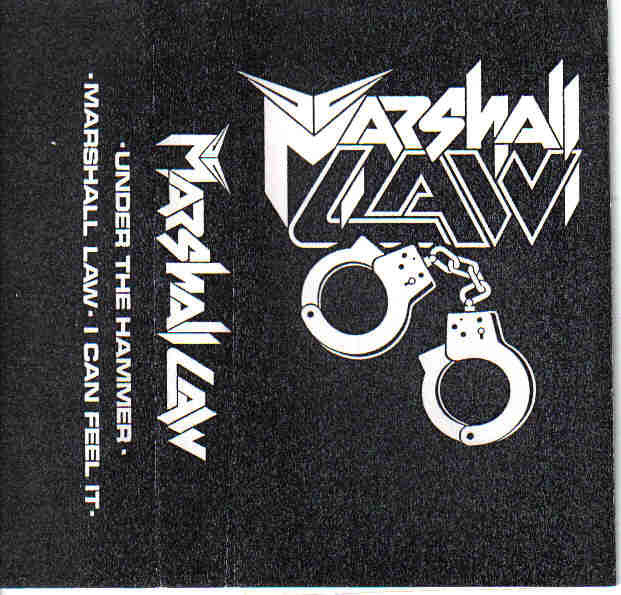 By the following month MARSHALL LAW announced they had mixed 'Axis Of Power'. New drummer Peter Hunt, a veteran of DRAGONFORCE and GEARED 4, joined the fold in February 2006. The band suffered a major blow in mid-March though, when guitarist Andy Southwell, a band mainstay since 1988, exited due to apparent "personal reasons." Within days his replacement had been revealed as being SEVEN WITCHES guitarist JACK FROST, an American scene veteran having high profile experience with SAVATAGE, METALIUM, THE BRONX CASKET CO., SPEEED and FROSTBITE. However, Frost exited in June. His replacement, announced in mid-July, was Dave Rothan, previously of DIRTY MINDS, the GRAHAM BONNET band and 80s covers act ROCK$TAR.